The Bohr model for the hydrogen atom marks the historic paradigm shift in the development of the quantum theory of matter . Bohr's original attempt to extend his model to molecules  has long been regarded as a complete failure. More recently, however, his molecular model has been revisited , specifically in connection with Dudley Herschbach's dimensional scaling transformation of the Schrödinger equation. In this Demonstration, we propose a modified version of Bohr's model for the lowest singlet and triplet states of the hydrogen molecule. The two protons, shown in blue on the left graphic, are separated by an internuclear distance . The two electrons, shown in red, traverse circular orbits of radii perpendicular to the internuclear axis and centered at distances from their respective nuclei. For the singlet state, the electron orbits are located between the nuclei and their electrons orbit in a contra-rotating sense. For the repulsive triplet state, the orbits are outside the internuclear axis and move in parallel. 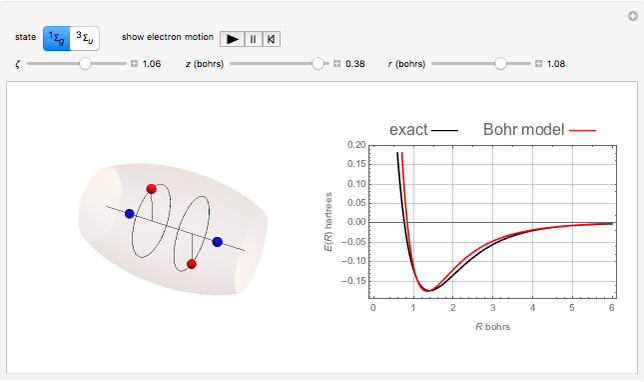 Select the parameters , and "by hand," using the sliders, so as to produce the best visible fit to the energy functions obtained by accurate quantum-mechanical computations. (We have added an additional effective nuclear charge parameter for greater flexibility.) We have not considered a more systematic procedure, in which the parameters can be determined variationally for each value of . The resulting energy curves, along with the corresponding exact results, are plotted in the left graphic, for either the singlet or triplet states. Snapshots 2 and 3 show near-optimized parameters for the two states. Wikipedia. "Bohr Model." (Oct 30, 2018) en.wikipedia.org/wiki/Bohr_model. N. Bohr, "On the Constitution of Atoms and Molecules, Part III: Systems Containing Several Nuclei," Philosophical Magazine, 26, 1913 pp. 857–875. archive.org/details/londonedinburg6261913lond/page/856. A. Svidzinsky, M. Scully and D. Herschbach, "Bohr&CloseCurlyQuote;s Molecular Model, a Century Later," Physics Today 67(1), 2014 pp. 33–39. doi:10.1063/PT.3.2243. S. M. Blinder. 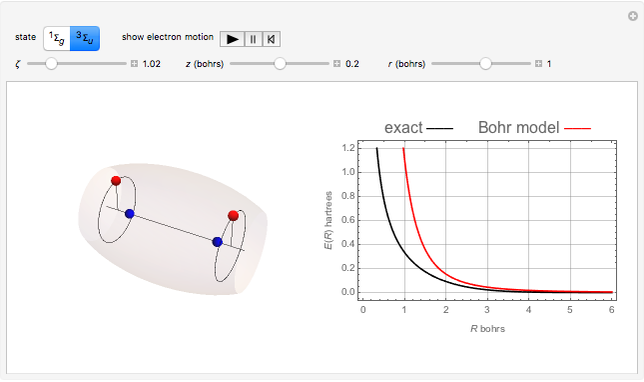 "Centenary of Bohr&CloseCurlyQuote;s Atomic Theory (1913–2013)" from Wolfram Blog—A Wolfram Web Resource. 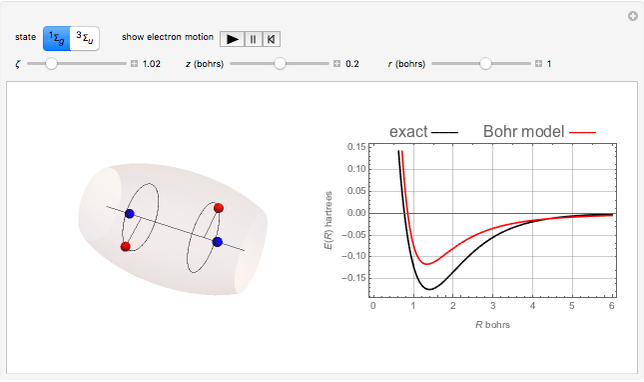 (Oct 30, 2018) blog.wolfram.com/2013/12/30/centenary-of-bohrs-atomic-theory-1913-2013. S. M. Blinder "Bohr's Model for the Hydrogen Molecule"